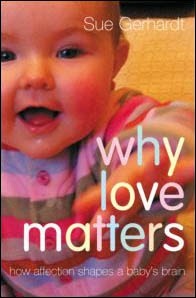 I recently read Why Love Matters by Sue Gerhardt. "Sue Gerhardt considers how the earliest relationship shapes the baby's nervous system, with lasting consequences, and how our adult life is influenced by infancy despite our inability to remember babyhood. She shows how the development of the brain can affect future emotional well being, and goes on to look at specific early 'pathways' that can affect the way we respond to stress and lead to conditions such as anorexia, addiction, and anti-social behaviour." So many people have recommended this book to me - many of them counsellor friends but also some fellow parents. I finally got around it reading it and can see why it is so highly recommended. Having taken an interest in the neuroscience of our emotions, a lot of this book was telling me what I already know, but I do think that it is pitched at a decent level for the average layperson who happens to be interested in learning about the science of our developing minds and how our early experiences shape those of our future. An important point for me is that we learn to regulate our emotions through the feedback our parents give us. So a neglected child, who is not taught or demonstrated how to handle emotions will not be as well equipped to deal with them as somebody who has had the relevant feedback and validation as a child. Moreover, by parents demonstrating an ability to handle their own emotions, the child will learn by their example. The book goes into a lot of detail about what exactly is happening on a physiological (neurological and biochemical) level in infancy and childhood and exactly how it impacts on our emotional intelligence. "Repeated positive experiences also get etched in the synapses as expectations of how to behave in relationships. But the neglected or rejected child doesn't end up with the same kind of brain. He doesn't get the opiates that will help build the medial prefrontal cortex...The expectations that are etched in his neuronal pathways are that others will not pay you attention or will treat you with aggression or hostility." This book also correlates with my intuition when it comes to parenting. For example, I have always felt uncomfortable with extremes of the controlled crying technique, "extinction" in particular. This book is not about shaming parents but about pointing out that latest findings in neuroscience can help us to shape future generations. We can use this knowledge and put it to good use when it comes to making decisions about how we care for our children. "...the most potent formula for change. Talking to others, forming a relationship with someone who listens to how you feel, is the major element in unblocking the emotional plumbing and in formulating new, more effective emotion strategies." "The progress of the therapy often depends on their ability to face their parents' human weaknesses and failings and let go of the hope that one day they will receive the loving care that they missed out on in early life. They grow up when they realise with increasing compassion that their parents are fallible human beings and perfect maternal or paternal love is unobtainable. Accepting that parents are only imperfect and struggling human beings leads to increased self-acceptance." An enjoyable and important read.